MIAMI -- U.S. Customs and Border Protection agents are defending their right to detain and arrest a woman found on a Greyhound bus in Fort Lauderdale without legal documents proving her citizenship. According to CBS Miami, agents boarded the bus on Friday as part of a routine inspection and asked passengers for proof of citizenship. 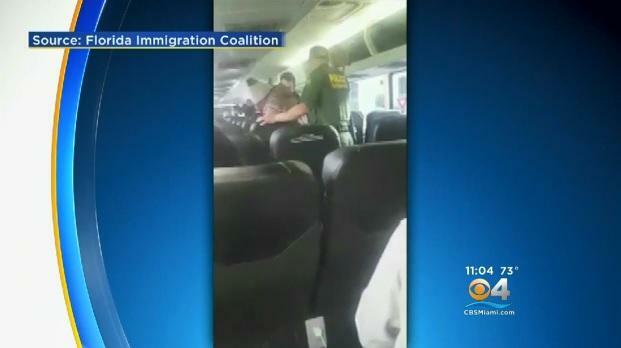 A video taken by a passenger, which was later posted on Twitter by the immigrant advocacy group Florida Immigrant Coalition (FLIC), appears to show a border agent asking a woman the location of her belongings before taking her off the bus. The video went viral over the weekend amid the government shutdown and breakdown in immigration reform talks. It's been viewed over 3 million times. According to FLIC, the bus driver told passengers security was coming onto the bus for a routine inspection. Instead, agents entered and began asking passengers to demonstrate proof of citizenship. After nearly 20 minutes, passenger Raquel Quesada said the woman, who was later identified as Beverly, was taken off the bus. "They asked everyone for documentation. It had to be specifically a U.S. identification or a passport with a stamp of entrance," Quesada said. "They grabbed her carry-on and escorted her off the bus." Just three days after she was taken into custody, Beverly was turned over to Immigration and Customs Enforcement (ICE) and Enforcement Removal Operations (ERO) for removal proceedings. According to border agents, she overstayed her tourist visa. Florida Immigration Coalition membership director Isabel Souza said she spoke to Beverly's frantic daughter-in-law. "She says she took her mother-in-law to the bus stop and hasn't heard from her since," Souza said. Souza added that the incident, though unfortunate for Beverly and her family, is not uncommon. "We've actually heard accusations of border patrol agents getting on Greyhound buses, specifically, for years," she said. Greyhound responded to the incident through a written statement, which reads in part: "We are required to comply with all local, state and federal law. Unfortunately, even routine transportation checks negatively impact our operations and some customers directly." Quesada said seeing it play out first-hand was more than some riders could handle. While agents were abiding by the law, she said it is important to not be afraid to ask questions and know who is looking at your documents. "At the end of the day, it is your responsibility as a citizen to ask those questions because if you don't ask them, nobody is going to ask them for you," Quesada said. FLIC claims border patrol agents should not have been allowed to board the Greyhound bus without an official judicial warrant. However, U.S. Customs and Border Protection officials say it's agents who routinely engage in enforcement operations at transportation hubs within the state of Florida. A former U.S. assistant attorney told CBS Miami that agents can do checks within a hundred miles of the ocean. In this case, that applies to the entire state of Florida.